Will a New Menu Attract Diners to a Lux but Covert Galleria Restaurant? 51fifteen Cuisine & Cocktails, the chic and hyper-modern restaurant on the top floor of Saks Fifth in the Galleria, is rolling out a completely redesigned menu by the restaurant’s new executive chef, Luigi Shimaj. The ambitious effort aims to increase the relevancy of this high-end eatery long kept in psuedo-obscurity by its own exclusive location. It’s been a little over two-and-a-half years since 51fifteen moved out of its namesake location in the old Saks Fifth on 5115 Westheimer and into the ultra-lux digs in the swanky new department store location. In that time, the restaurant has made few waves in Houston’s dining scene, perhaps due to an unintentional level of anonymity. Being tucked away in the back of a luxury department store among $2,500 dresses and red-bottomed heels doesn’t make for ideal foot traffic. Most luxury department store restaurants cater exclusively to retail customers already there to do some shopping. 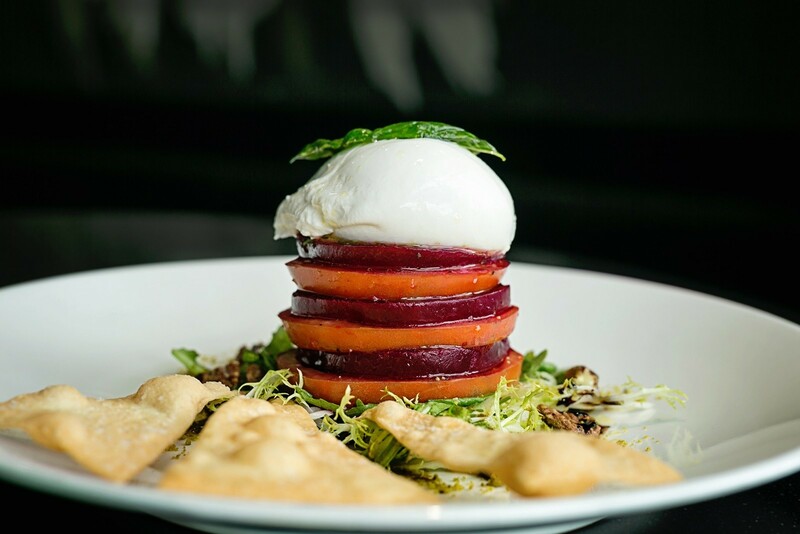 With Shimaj’s new menu, and a sprawling dining room that’s been meticulously designed to be posh, sleek and modern, 51fifteen sets its sights higher than Caesar salads and Junior League brunches. The question is, will it work? Beet and Tomato Caprese Salad with with fresh burrata cheesed at 51fifteen Cuisine & Cocktails. Photo courtesy of 51fifteen. Shimaj has a Florentine background and uses that influence in his dishes. He calls his menu “French, Italian, and Mediterranean inspired, yet locally sourced.” Highlights include a layered Beet and Tomato Caprese Salad with fresh burrata cheese; grilled calamari salad with frisée, radicchio and citrus sesame seed dressing; and a fillet of seared salmon laid over a bed of squid ink risotto (Risotto Nero) and green pea mousse. 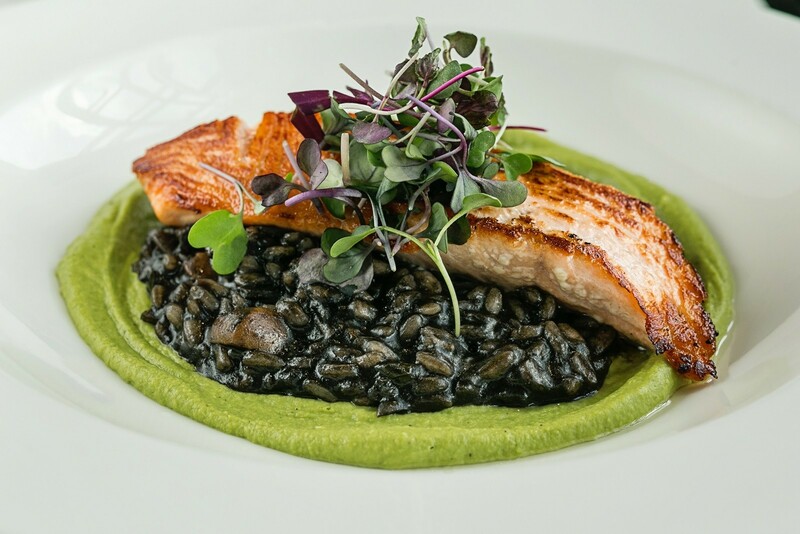 The pitch-black risotto over the pale green swath of smooth, creamed peas is like a beautiful painting behind the seared salmon. It’s a dish that involves complex yet complementary flavors — an indicator of chef Luigi’s good instincts for ingredients and techniques. The Risotto Nero is also available as its own entrée on the dinner menu. Shimaj’s desserts also impress, including White Chocolate Bread Pudding and a trio of sweet brunch crepes that includes a decadent tiramisu rendition with chocolate ganache and pistachio dust. The luxurious 51fifteen bar also rolls out many flashy and seductive drinks — all at Galleria prices, which can leave even the heartiest wallet feeling abused. 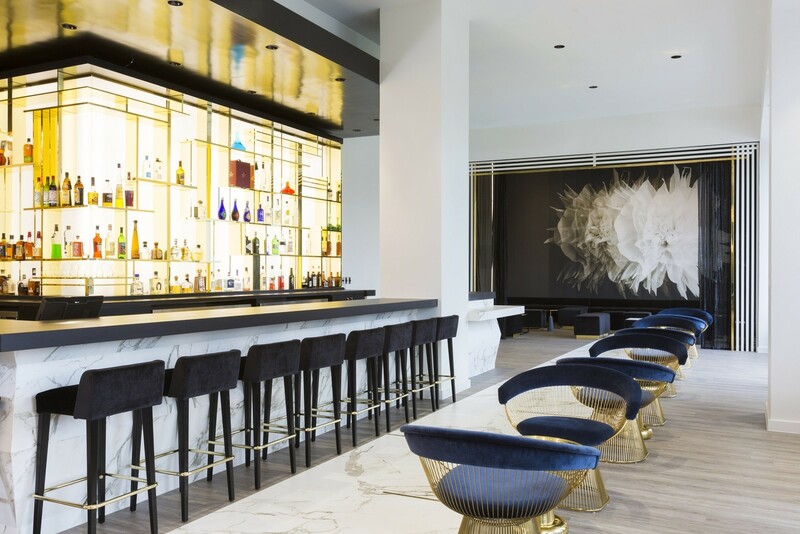 Unlike other department store restaurants, 51fifteen is owned by a third party: Landmark Hospitality, the restaurant group behind downtown’s popular Hearsay Gastro Lounge and its similarly named spinoffs. While the restaurant has had a long and successful partnership with its retail host, it’s a 9,500-square-foot venue and The Galleria isn’t known as cheap real estate. Add to that the fact that Saks Fifth is, by design, an exclusive and lightly trafficked store, and attracting a profitable number of daily diners becomes quite the challenge. Luigis faces the unenviable task of living up to the bourgeoisie expectations of his luxury digs, while maintaining a menu that appeals to a broad enough audience to keep the doors open. Should he be successful in his new role, curious diners who make the trek upstairs may find a new favorite hideaway.